Nintendo Land is lots of fun. In some ways it's exactly the kind of fun you had when you played Wii Sports for the first time, regularly erupting into laughter and occasional curses when things don't go your way. It didn't look much on stage at E3, but Nintendo's right to put its faith in the game's ability to communicate what makes Wii U different: to play Nintendo Land with other people is to enjoy yourself immensely. Leaping right into the game's multiplayer side we signed up for Animal Crossing: Sweet Day. Here, the GamePad users controls police pooches Copper and Booker — carrying a knife and fork respectively — who must chase after four Miis dressed as AC characters (Tangy, Lily, Peanut and what looks like Axel). The four players have to work together to collect 50 pieces of candy, released by shaking trees, but if the dogs make three 'arrests' it's all over. Like all great multiplayer games, it's immediately straightforward but deceptively tactical. The biggest hauls of candy require three players to stand in the same spot for a few seconds, giving the dogs chance to close in, so smart teams will leave the sweets on the floor to collect later. The more each player eats the slower they go, so a rogue gobbler will be an easy target. Matches can be over in seconds if the animals don't work together, or last for ages if they're smart (or the GamePad player is clueless). It all feels sharp and astutely honed; the competition is delicately balanced, and full of tense narrow escapes as the dogs fling themselves at nearby runners or a big-headed elephant drops its hard-won stash to flee from a dog with a giant fork. 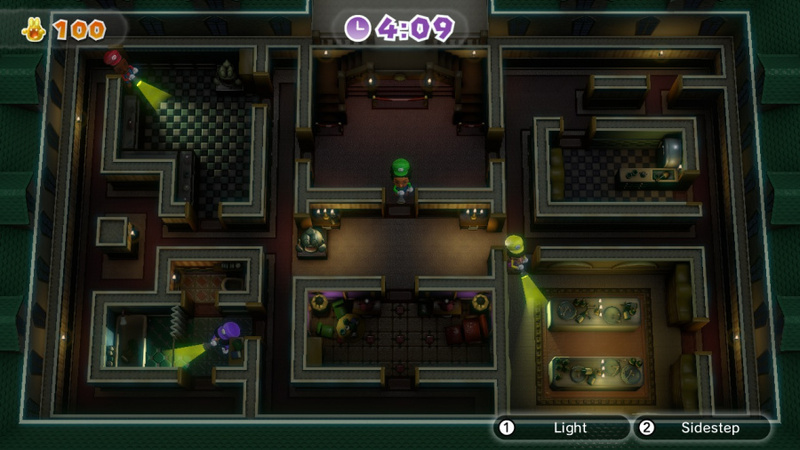 There's more head-to-asymmetric-head in Luigi's Ghost Mansion. You've probably already had your fill of this after Nintendo laboured its reveal during E3, but after playing it we realised it was worth the stage time. On the surface it's hide and seek, but underneath it's a mischievous test of teamwork and psyching-out your competitors. The GamePad user controls a ghost who must drag away four ghost hunters; the four frightened friends have to track down the ghost and shine their torches to damage it. The win conditions are simple, but it's more cut-and-thrust and far more tense than we'd expected. The ghost's invisible, but when the spirit nears a player their Wii Remote will vibrate; slowly at first, then building strength as it gets closer and closer. Smart teams will use these indications to close in on the ghost, but the map's smartly designed and unless everyone works together a smart spook will be able to escape. If the ghoul does grab a Mii and make it faint, other players can revive them by shining their torches on him or her, but this puts them at risk. Again, clever teams will place people on watch, while the ghost can try to lure them away by hovering just close enough to tempt them from their post. The vibrations also work through walls, so the ghost can use these for protection instead of putting itself in the line of fire. Like Sweet Day, Luigi's Ghost Mansion is a simple concept that's easy to grasp but offers subtle depths. By our second game we were shouting commands at our team mates (whom we'd just met) and cursing them for taking the precious batteries, all while the ghost tried to psyche us out with sneaky runs and hints of its location. It's perfectly pitched, bouncing from tense silence to chaotic outbursts of laughter and yelped orders. Nintendo Land isn't all competition, though; there's also collaboration in The Legend of Zelda: Battle Quest. 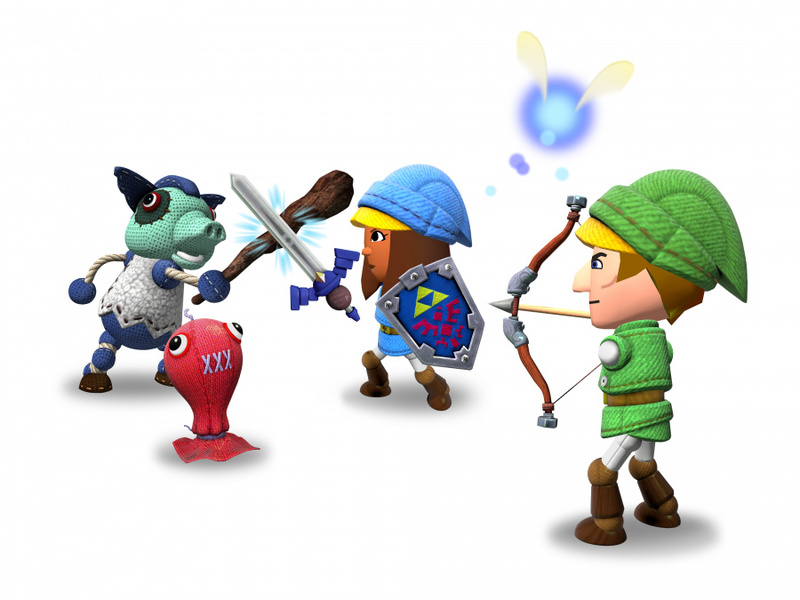 Here the GamePad player fires arrows while three others use Wii Remote Plus controllers to swing their swords, with some enemies only succumbing to The Legend of Zelda: Skyward Sword-style directional slashing. The GamePad player launches arrows using the controller's right analogue stick — no need for touch screen here — building more power the longer you hold down the stick. The motion control is impeccable, letting you loose accurate shots with little effort and playable in either portrait or landscape, depending on your preference. This being Zelda there are times you'll need to work together to activate switches to open areas, but the level we played was more about waves of enemies than putting puzzles in your way. A communal stash of six hearts depletes whenever any player takes damage but can be replenished by taking down special enemies: a cucco flies overhead at one point, requiring a keen eye and steady aim from your archer. Of the multiplayer games so far, Battle Quest feels like it belongs the most to Nintendo Land's pitch as a Nintendo theme park; whether it's the on-rails movement or feeling of all working together, it's all about action on the path to the boss (a giant clothy Bokoblin, of course). It's jubilant and empowering: you'll hold your blade aloft not just to activate its Skyward Strike, but because it's fun to charge at its hordes of stitched-together enemies with your sword in the air. Battle cries are encouraged. Nintendo Land wants to communicate Wii U's asymmetric concept for fans of multiplayer, and the three games we've played did that expertly. They don't need lengthy explanations, and while they may not have the immediate appeal of motion-controlled sports, they're certainly simple enough to be inviting for gamers and non-gamers alike. 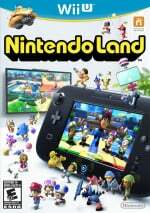 Forget its underwhelming debut: Nintendo Land looks like being the real deal. It all looks fun... but I don't play much multiplayer. Looking good. I just hope there's some depth to it if they plan on selling this as a retail title.. Not to sure I'd be willing to pay full price for it. 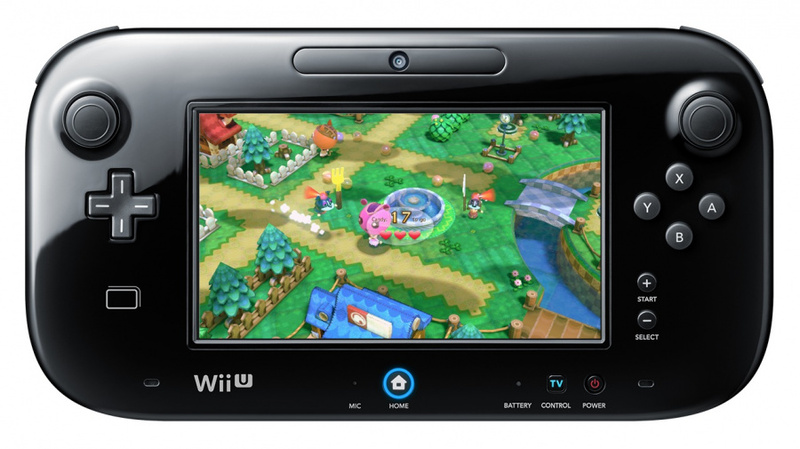 They should definitely do a 'WiiU+NintendoLand' bundle on release day. Oh, so Animal Crossing Sweet Day is an evolution of Chase Mii? Interesting. hopefully you can play this game solo too.Just got 2 Wii Remotes. I'm buying more Wii Remotes simply for this game! Hopefully, they will come in handy with more asymmetric multiplayer games! That looks like a fun multiplayer game. @BenAV First of all how do you seem to get the first post a lot LOL!? I still say most people are crazy if they think they wont get this game. Its classic Nintendo through and through and that's why we play Nintendo game to begin with. Now it maybe packaged with the system but if not it should sell millions as long as Nintendo markets the game well like it did in the early days of the Wii!! "Wii would like to play"
I don't have to play it to be convinced: I was a huge fan of the asymmetry of Pac Man VS and used to bring it out at just about every gathering of friends at my house. I'm also the fanatic who bought up 4 cheap GBAs and link cables so that I'd have Four Swords Adventures ready at any time that I could convince others to join me. Games that exploit the shift between public screens and private screens are such a joy for local multiplayer. Those renders look really good. I can't wait for this game! The more I read about it, the less patience I have. Also, I agree with @wariowoods, Pac Man VS and Four Swords were some of the best multiplayer games I've played. I hope they end up on VC or that Nintendo decides to make updated versions. Make it a pack-in game like Wii Sports and i'll get it, but by itself, no thanks. Sounds like fun and the more I hear the more I'd like to give it a try myself. This does look like a fun game and would make a great pack-in game but if its not a pack-in game, I still might get it. Sounds great! The problem is I don't play much multiplayer on any game. I'll need a good single-player game on release. Does anyone think that the Metroid Wii U game from E3 2011 will be in Nintendo Land? This looks more fun than Wii Sports was! Exactly what I want and need as one of the introductory games of the system. @Tech101 Haha, there just tends to be a new article a lot of the time when I refresh the page. I'm very curious to see the other 7 games they have... So far the Zelda one looks to be the best one. Love 1:1 sword gameplay. That amusement park certainly looks pretty. It's definitely more colourful than some of the real world amusement parks I've visited. Thanks for the impressions, James. Sounds pretty encouraging to pick up, although I am not one to have friends over that often. Maybe that could change with this. Also good to see some minigames are still secret, to build up some hype and speculation. Well I'm glad with this review because unfortunately the E3 presentation was very labourious. I did see past it though and I think this could be a really good game, especially when everyone who has played it says so. Thing is with Pikmin 3 and NSMBU, Wii Fit U and Batman Arkham City, as well as a few others, this game is way down the list so I'm really hoping it will be bundled with the console. If not, I'll have to wait to get it cheap, which when you consider the aspect of the Wii U is a shame really! I'm hoping against hope that Nintendo bundles this game with the Wii U. Part of the reason that the Wii was so successful was that everybody who bought the system, for whatever reason, ended up with a copy of Wii Sports. Those parents who didn't try the system in the initial push and finally caved later to their 8-year old's desire to play Mario picked up a Wii and the game, and then immediately discovered a reason to play the system — and for them it wasn't for the Mario game. It allows them to not have to worry about where the characters arms are positioned, which more than likely would restrict what the player in the real world can do to make their character mimic on-screen. Either the arms would move in unnatural ways or the character would be restrained so they couldn't reproduce the player's full range of motion. The simple solution is to lose the arms and position the hands wherever the controller says they should be. Looking sweet and spicy like chicken nuggets! I won't buy this game unless it comes with the system. I just can't afford it. I believe that it's a good game and I'll but it at some point if it isn't w/ the system, but I just don't see any way at all to compare this to Wii Sports. Wii Sports sold due to simplicity of control. You want to bowl, bowl; you want to play tennis, swing the racket. Either single or multiplayer it was that simple. Aunts, uncles, parents and grandparents were playing it everywhere. This is a video game played on a screen like every other videogame ever made. Sure, it's "asymmetrical", so what? How many people are waiting to buy "that asymmetrical game"? Good game, yes. Wii Sports, huh? Okay, I'll admit that this sounds a lot better than it looked at the E3 press conference. I guess I really have to see it and experience it for myself to judge it appropriately. I'm hoping that Nintendo will set up demo kiosks for this game before the Wii U launches. I'm still not completely sold on it yet and I think it would be in Nintendo's best interest to bundle this game with the Wii U system at launch. I must say that this asymmetric multiplayer reminds me of the 1 vs. 3 minigames in Mario Party. I loved those minigames, so I have a feeling I'll enjoy this very much. I believe the new slogan has already been decided by Ninty. I'm getting a new flat with some pals soon which will culminate in the purchase of a Wii-U, and this looks like it would be perfect evening fodder for a few weeks at least! Yeah, bundling it with the system would most likely make the most sense. If not it should really be available for "cheap" imo. Not having to always insert the disc would make this a very good download title as well. Also, the games journos seemed to like this from the press events. Most people rarely have 3 or 4 friends to play together. Is it known if those games are playable by only 2 or 3 players? summer wars anime, its real! I really would like to see people move away from the "this should be free" mindset. 12 attractions with multiple levels, support for between one and five players and more; it's an actual, proper game, not just some throwaway tech demo. Then it's settled! This game should be nothing more than free! @Retro_on_theGo Er, ahem, I seem to have missed out an important word from that sentence...! A lot of times when reviewers say it's a shame there's no online multiplayer I disagree, with the NSMB series for instance, but I would actually be rather bummed out if this one only has offline multiplayer, because I rarely have enough people around to play local coop, and face it, this sort of game wouldn't be quite as entertaining with computer players.. I doubt whether they'd even make that possible, so here's hoping you can even play these games if you're all alone at home.